Well, it’s been awhile since I’ve been here because I’ve just been a lazy cat! You know how it is, chasing little lady bugs and eating, sleeping & just trying to look purrrrty for everyone; is a job in & of itself! I’ve been doing just those things and it’s full time! No, honestly I’m thinking my Meowmy must’ve just been super busy? She has to allow me my computer time ya know? She was sick a lot since August also! But I’m baaack! I’m here to stay and very happy to see new followers! Thank you so much! I’ll try to share my most interesting stories with you! Do you remember how I started life out in an abusive home? I’ve never enjoyed food and I don’t love wet food like most kitty’s. I have never liked treats either! Something must’ve happened to me that I don’t remember? I do know that I was in a hoarders home and I was abused, though….the first 1 1/2 years of my Little life! But then I found my pawrents! Everything has been so much better since we found each other! But, still… my Meowmy has tried so many different treats and she’s just wasted money after money because I don’t like any treats! I never have!! Wellll until now!! Meowmy finally hit the “jackpot”, and she finally found some treats that I like! But…..then ……now I have totally stopped eating wet food of even the best kinds!! But she got me a special kind of treat stick called “Sheeba”! She breaks it in half and gives me 2 halves each day now! I get really excited and I cannot wait for them to eat breakfast! I get one snack then and one snack later in the evening! I’m not sure why she’s so excited? But I sure am happy!! I even play with the treat a little bit before eating it!! MOL…(do you know that “MOL” is “Meow out loud”? ) … ohhh and there’s another treat that they found for me and I cannot even believe that I also like the little pieces of real tuna and real salmon! I cannot remember the brand name of those? But I’ll tell you the next time we hang out together, OK? Well, I just wanted to share the great news about Miss Finicky, me, actually eating & enjoying treats for about the past 2 months or so? I guess you can’t teach an old dog new tricks!!!? But you can still teach a smart, (almost 8 year old) cat, to like treats!!! After years of my forever not liking them, I really do! Previous Dear Diary, It’s All Up To Me! Next I Got A New “I” Pad! I am sorry your mom was sick.I am glad you like a treat. 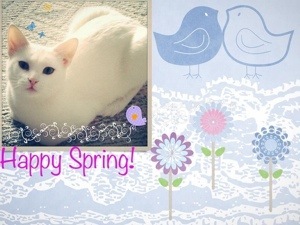 This is a Diary of a small white domestic med/short hair cat named "Luna Skye". She talks from her own perspective, about starting life in an abusive "hoarders house" to then a loving home where they are crazy about her. Angel Kitty Luna Skye! Facebook Celebrity Pet Page Luna is a “Chemo Angel” Kitty and she sends uplifting notes, pictures and gifts/toys to children and others with Cancer, who are going through Chemo therapy. My YOU TUBE PAGE a link to my You Tube page with some video’s of “Yours truly”!! My Catster Page "Luna Skye"